There are new global health threats, such as the Zika virus, that make it increasingly urgent for all countries to collaborate on health. MEDICC Review has published a new double issue of the peer-reviewed journal that features articles on Cuban health and medicine and international research related to health equity and vulnerable populations. “Editors’ Choice” articles include Cuba’s national public health efforts to contain the Zika virus; a groundbreaking study on renal damage in rural Salvadoran children and its link to the epidemic of chronic kidney disease of uncertain causes; and survival rates in Cuban tuberculosis patients. The issue also includes reporting on Cuba’s national organ donor and transplant program, and a Viewpoint by MEDICC’s Executive Director urging greater access to Cuban medical innovations, given the new US-Cuba diplomatic openings and potential health benefits for thousands of Americans. 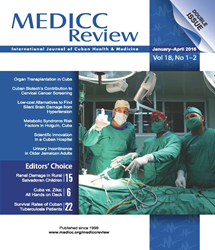 MEDICC Review is the first peer-reviewed journal in English dedicated to publishing original manuscripts by Cuban health and related professionals on topics of medical research, population health, and policies and practice of health in Cuba. The journal also publishes international authors on subjects related to health equity and vulnerable populations. Some 40,000 articles are accessed monthly by readers in 140+ countries.